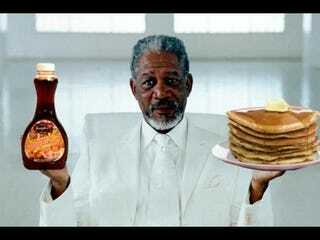 Our father who art with pancakes, hallowed be thy pancakes. Raise your hand if you eat pancakes. Ok, now put your hands down. You look like idiots sitting in front of your computer with your hands raised. You’ll notice I just assumed you all had your hands up. Why? Well, duh....pancakes! Who doesn’t like pancakes? No one, that’s who. Not everyone is a fan of the traditional American style flapjack, but other pancakes from other countries? Pannenkoeken? Raggmunk? Crepes? Cong You Bing? Blintz? Uttapam? Arepas? Dosas? All a pancake is, is a cake. Made in a pan. Out of a thick batter. You could cook a regular chocolate cake like you would a pancake if you wanted. I don’t recommend it because there are differences in the batter, but you could do it. It’d be messy, though. I’m not a huge fan of American style pancakes, but I’d eat an apple Pannenkoeken every day if I could. You may have heard them called Dutch Babies, but Pannenkoeken is the proper name. If you don’t live in an area with a heavy nordic population, you probably haven’t seen one. If you ever do, eat it! My reason for not really liking US pancakes is because of my aversion to maple. Maple is one of those flavors that I just don’t like. And if there’s any maple flavoring in something, I can tell. And no, it makes no difference if it’s 100% natural maple, or the fake Aunt Jemima crap. I just don’t like maple. So, as a kid, I never ate them at home because maple syrup is all mom would buy. And I just never ordered them when dining out because there were so many other good things to eat that I never bothered. If served pancakes for breakfast, I will eat them. I just put peanut butter and jelly on them. Try it. It’s a good thing. But today I’m not here to tell you about pancakes. Or about my peculiar dietary habits. It’s an inherited disease, and as such it’s typically diagnosed in very young infants. They will be born healthy, but within days or weeks deteriorate rapidly exhibiting severe brain damage which could become permanent if treatment isn’t rendered quickly. With care, the condition can be controlled with a proper diet. However, this diet is stricter than a diabetic diet. It’s very easy for a sufferer to be afflicted with an attack of the disease. And the results of the disease are not pleasant. Many people who suffer from this disease are on such a strict diet that they have to be fed through a tube so dietitians can carefully monitor exactly what they are taking in. And if the blood chemistry get’s knocked even slightly off balance, it will result in a weeks stay in the hospital while they filter the blood to ensure a proper balance of sugars and proteins and whatnot. Branched-Chain Ketoaciduria, as you can see, is not some piddly disease. In some cases though, a liver transplant can restore normal metabolisms to sufferers, and that allows them to live almost normal lives. But it isn’t a cure. Not by a long shot. Remember how I said it was an inherited disease? Well, to be a sufferer, you need to have a matched pair of mutated genes. You get one from each parent. And since both copies of a victims genes are mutated, they will pass a mutated gene on to their children. If their spouse also passes the mutated gene on, the resulting offspring will also be affected. But most people don’t suffer from the disease. If only one of your genes is mutated, you’ll be fine. Some of you who are reading this could have the mutated gene without even knowing it. Currently only 1 out of every 185,000 babies born today are affected, so it’s fairly rare. Instances of the disease are higher in closed societies due to the ‘Founders Syndrome’. (this just means that there’s less genetic diversity so mutated genes get concentrated making their distribution is higher). The Amish, Mennonite and Jewish populations have higher instances of the disease than the general population. Well, I think that’s about it. Except......oh yeah......I was going to try and make this funny. How can I do that? Hmm.......see, the problem is, it’s actually a fairly serious disease that affects the really young. How can I inject humor into that? Maybe by combining this disease with pancakes? Whaaa? Ok, remember how I said I detested maple? You might start liking it less now. Branched-Chain Ketoaciduria is the diseases formal name. But it’s not what people call it. Seriously, try saing it out loud. It doesn’t really roll off the tongue. Instead, it’s referred to by the acronym MSUD. Don’t look at me! I didn’t name it. I just tell you like it is. The reason it got that name is for the simple reason that, one of the first signs of the disease is, you guessed it, the baby’s pee will smell like maple syrup. This is due to the way the disease processes sugar in the blood. It also used to be the way it was diagnosed. Doctors say though, that the infants ear wax will have a more intense maple smell than the urine, but who cleans a babys ears and smells the wax? That’s just gross. Whereas people come into contact with a newborns pee all the time. The reason it takes a bit of time for the diagnosis after birth is because the smelly compound has to build up a high enough concentration in the baby body to be smelled. These days the test for MSUD is one of the routine tests they give new borns and they can detect the disease within 24-48 hours of birth, before they start to smell like breakfast. While the vast majority of MSUD cases are diagnosed in infancy, if you wake up one day and your pee smells like pancakes, you might want to get it checked out. Or, you know, stop the illicit affair with Mrs. Butterworth. And look, by coincidence, this is posting on a Tuesday this week. Still haven’t decided if Tuesday will be the normal day, but you never know.